Join Captain Redbeard and his pirate crew as they try to find a valuable map leading to hidden treasure. The ship really floats, and it features booms with sails that can move, a cannon that shoots, a crane with winch, a crow's nest, a treasure chest, a treasure map, and an anchor. Set also comes with a story poster and comic. 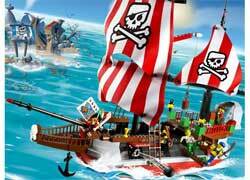 Contains 134 LEGO building pieces, including Captain Redbeard, Harry Hardtack, Jolly Jack Crow, and Scurvy Dog figures. Bulletin Board located on Lugnet. Features opinions, reviews, projects, layouts, plans, tools, ideas, magazines, or historical events as they relate to Pirates. For Lego, an Online Lifeline? Motorized HogwartsT Express really runs on the rails! This Hogwarts Express is ready to run on LEGO train tracks! With a motor to make it go, it's a great addition to both your Harry Potter collection and your train collection. Watch the train pull up to Hogsmeade Station, then take the roof off the passenger car to put Harry, Ron Weasley, and Professor Lupin inside. But watch out for the dementorT! Take coal from the coal car, put it in the drawer in the boiler, then tip it over so the boiler gets fuel. Then you're ready to roll again! Fully compatible with other LEGO Train sets. Includes Harry PotterT, Ron WeasleyT, Professor Lupin, dementor, speed regulator and 33 inches of LEGO train track. Action with the ARC-170 Starfighter! 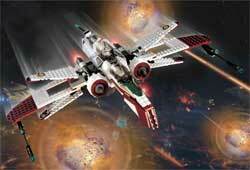 The ARC-170 Starfighter is on its most dangerous mission! Piloted by an elite crew of clone troopers, this sleek ship rules the spaceways. Features wings that open into attack position and "bombs" that drop. Includes 3 Clone pilots and an R2 unit.